Everyone loves a good top ten list. We’ve come up with our list of the ten drones that we are most excited about right now. This eclectic list isn’t necessarily in any order and covers a wide variety of different drones. We’ve flown all of these drones and we love them all for different reasons. If you are looking for more guidance in finding the right drone for you, check out our Best Drones Now article. DJI Mavic Pro– So this list may not be in any particular order, except maybe for this one. The Mavic is our favorite drone on the list. It does everything well. It takes 4K video, has obstacle avoidance, advanced flight modes and a killer range. Oh yeah, and it folds up to be about the size of a water bottle. The only drawback is its $999 price tag. It is worth it, but that is a decent chunk of change. Learn More. Buy One. DYS Elf– This little quad is a brushless beast. It isn’t the fastest brushless micro FPV quad out there, but it is one of the toughest. We love its ability to bounce off trees and keep on flying. If you want to learn how to fly FPV and you are ready for a brushless quad this is the one to pick up. It even comes with a remote transmitter. 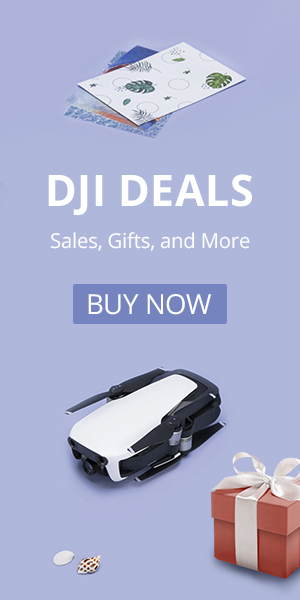 You can upgrade to a Taranis QX7 on your own time. Learn More. Buy One. 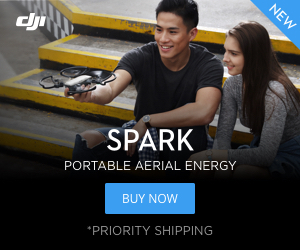 DJI Spark– The drone to take with you everywhere. We are surprised just how comfortable we are pulling this out everywhere we go. It isn’t nearly as loud as the other DJI drones and it won’t send mothers scrambling to protect their children. Photographers say that the best camera is the one you have with you. This is the drone we have with us wherever we go. While the gesture modes still need some work, we love this pint-sized quad and you will too. Learn More. Buy One. You can see the compact size of the Spark as it gets a ride on the back of a Phantom. Virhuck Volar 360– This tiny little quad is a straight up blast to fly. In high mode it spins like a top and with the LED lights it is something we can only describe as “disco mode.” Its remote has a built in place to keep this tiny little machine. It may not have the features or the stability of one of the big boys, but this little guy has the fun factor going for it. Learn More. Buy One. Cheerson CX-60– These might be the most unique drones on the list. When you order the CX-60 you’ll get a pair of battle drones. The CX-60 is essentially a real life video game. You fly your drone, your buddy flies theirs and you shoot infared laser beams at each other. Does it get better than this? Learn More. Buy One. Eachine QX90c– This is the best brushed micro FPV quad on the market right now. It is light, fast and durable. You can pick up one of these bad boys for around $50. It is a heck of a deal. It beats the pants off of a Hubsan X4. Learn More. Buy One. DJI Phantom 4 Pro– This is the machine if you are looking to get professional quality photos and videos. Sure you could opt for the awesome Inspire 2, but this engineering marvel costs about half and still packs in awesome flight modes and features like full-on obstacle avoidance. Learn More. Buy One. MJX Bugs 3/Force1 F100– Maybe putting two drones here is cheating, but these two quads are essentially the same thing. They are ultra versatile quads that you can use to carry a GoPro or opt to add FPV. You will be hard pressed to find a brushless beast like one of these in the same price range. Learn More. Buy One. Take a look at the F100 and the Bugs 3. They are two awesome drones. Eachine E011– This tiny micro quad has some serious power. The Inductrix Pro is a solid machine, but even it is going to have a hard time creating torque with its 6mm motors to compete with the 7mm motors on this little quad. For under $25 this drone is an absolute steal. Learn to fly it then add a camera and whoop up on all of the Inductrix-loving Tiny Whoop fans out there. Learn More. Buy One. Syma X8HG– The Syma X8 series is one of the best series of drones ever created. Sure they stole their design cues from the DJI Phantom, but they put their own twist on it. These affordable quads can carry an action camera, so you aren’t limited to the standard stock camera. They are stable and depending on which model you choose will come with a variety of features. As an added bonus most Syma X8 model are almost indestructible. We have crashed ours countless times and it keeps on going. You’ll be hard pressed to find a more affordable and versatile quad out there than a Syma X8. Learn More. Buy One.